Hello there! My name is LucasRCD and I'm a (somewhat) regular user, to no one's surprise. I'm not as active as I used to be; I'm mainly posting on the Forum Games subforum nowadays. I'm working on many things: A forum game, a hack, a potential fangame, alongside other things. I'm a rookie pixel artist who's always looking for feedback. You'll see me occasionally posting my art in the #showoff channel of the SMWC Discord server. I like creating my own characters, who always have weird names. The first one I've ever made? 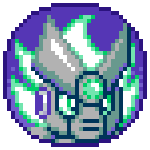 Variable Y, a robot who can control both light and darkness, with a dark green body, light green plasma hair, and a "face plate" designed to resemble the letter Y. You'll often see me using him as my online avatar. Awesome layout that was made by Erik557 during C3 Winter 2016. I love the Mega Man Battle Network series, if you couldn't tell by just looking at my layouts.